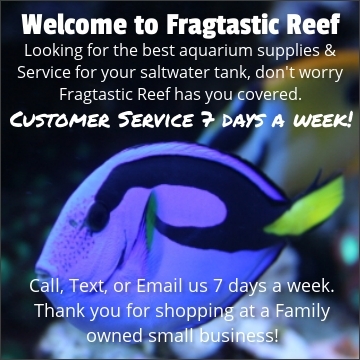 Welcome to FragtasticReef.com our family owned & operated online local fish store! We started as a saltwater aquarium hobbyist just like you over 18 years ago and have been doing it ever since. In those 18 years of being in the saltwater hobby we have learned a lot, and continue to learn everyday, which is what makes us different than everyone else. Having a full retail aquarium store along with the website gives us the advantage over every other place online. We have direct experience with all saltwater aquariums, vast knowledge of products (since we use them also), and accountability. Accountability is huge in the aquarium industry since there is so many other vendors and sellers just trying to make a quick buck, and some of them out of their house. You can trust Fragtastic Reef when it comes to saltwater equipment and livestock because its what we do for a living. Why can you trust Fragtastic Reef vs The Other guys? Because first and foremost we don't call ourselves experts and why you might ask? Well most people in the hobby for over 18 years would call themselves experts also, but not us! We believe in no such thing in this hobby as it seems to be a forever long learning curve. We take great pride in the products and knowledge of the products we sell, otherwise we don't sell them! We will never recommend an aquarium product that is not right for your saltwater aquarium. There is many times a customer has called looking at a specific product and asking if its available, after talking with the customer about their setup we may recommend something completely different, maybe even cheaper in price. We want you to succeed and be happy with your aquarium or fish tank, because your success means more to us than your money! The Other Guys can say "yup we have that protein skimmer in stock" and take your money, but did they try to find out if that is the best skimmer for your aquarium? When you call, email, or text us you are talking with the owner Garrett. No waiting on hold or being transferred to a different person - one phone number - one single person. Need to talk with the shipping department? Yup you guess it Garrett is that person! Need to talk with someone about your order you placed? Yup Garrett is that person again! Need to send something back or change something on your order? Garrett is that guy again. Wanna tell someone how awesome Fragtastic Reef is? Besides telling everyone you know, call me (Garrett) I really enjoy catching up with customers. #1 Most important reason to shop with us: We are a local fish store and your business means everything to us and our family! We treat our customers like family.